After our long journey to reach Kauai, we spent our first day relaxing. Tawn was a little under the weather, so extra napping was called for. We were renting a 2-bedroom condo with my parents in the Poipu Beach area on the south side of the island, and all of my cousins and aunts and uncles were in houses nearby, although at this point we didn’t all know where exactly everyone else was staying. The beach was literally just around the corner from our condo, maybe a two-minute walk. The nearest area was very rocky but a sandy area (Brennecke Beach) was another minute or two away. The weather was extremely pleasant with a nice breeze, so I went walking down by the water, first with Tawn and then later with my mother. A beautiful tree we saw. I stopped by a nursery later in the trip to find out what type of tree it is. It is called a “monkey pod”. Looks like something out of The Lion King. The sun starts to fall towards the horizon. We saw some beautiful sunsets while on the island. Interestingly, Kauai is twice the size of Singapore, but has about 80,000 residents compared to 5 million on Singapore. One thing we saw plenty of on the island were these wild chickens. Without any snakes, mongoose, or other natural predators, their population is pretty out of control. In the next entry, I’ll share a bit about the food we had. This entry was posted in Uncategorized and tagged Hawaii, Kauai, Poipu by christao408. Bookmark the permalink. 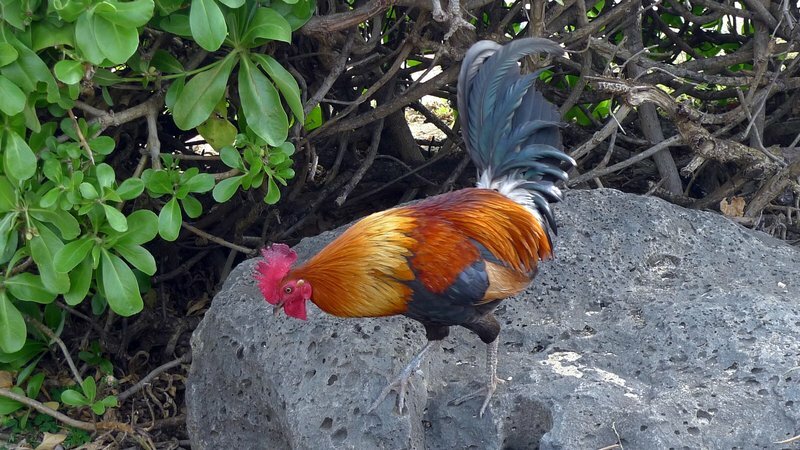 I thought the feral chickens in Hawaii were fascinating when I was there. I love Kauai. You’re right…the tree looks like it is straight out of Lion King. What a fashionable photo of Tawn doing his power nap. A few moments ago, I was checking out hotel & air packages to Kauai, not cheap though! There are lots of good hiking trails all over this hilly island. Tawn looks very relaxed. It’s interesting that you would put a reference to food right after the rooster. I wonder if it went into your stock pot. 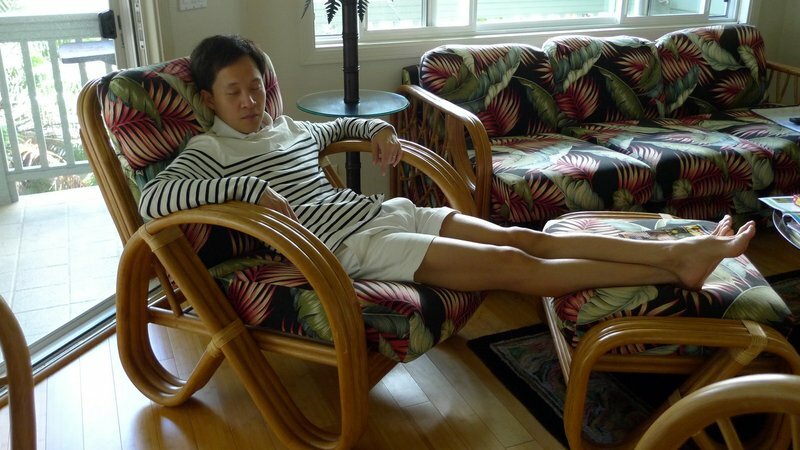 my grandparents used to have furniture like the one that tawn is resting on… different pattern for the cloth cushions, but the wood part is very similar.oh, monkey pod trees! yes, they are quite nice, but they do drop fairly large seed pods.sunsets in hawaii are the best! 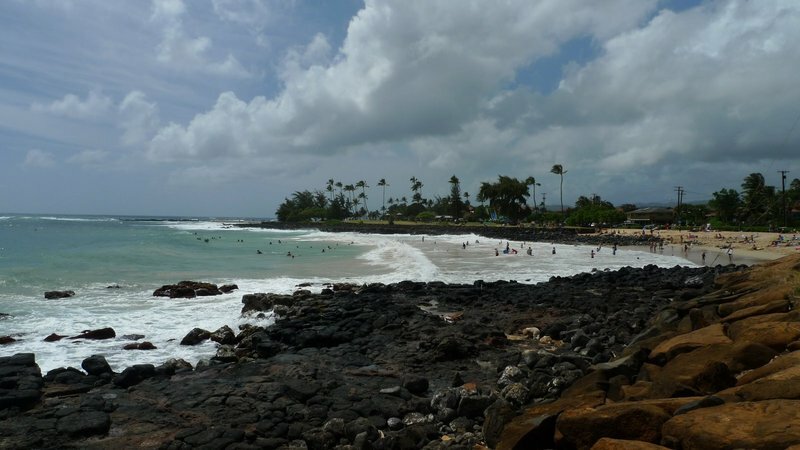 You’ve definitely captured the essence of Hawaii in this post! But no mongoose on Kauai? — they’re a real pest elsewhere in the state (or used to be). I’m glad Tawn was able to rest – and even “under the weather” he looks fashionable! hehe! Love the look of the lava rocks at the beach. No getting away from the fact there are volcanos nearby. I consider Kauai to be the most beautiful of the island. I would move then in a minute if I could. Maui for golf of course lol. I think Aaron is bias lol. That is Very Lion King-like. Will we be seeing any pictures of you with Chow? @ElusiveWords – @ThePrince – There are these t-shirts they sell on the island with the recipe for Kauai chicken soup printed on the front. It goes something like this: put a Kauai chicken and a stone in a pot, cover with water, and cook until the stone is tender. Then throw out the chicken and eat the stone. @Roadlesstaken – Tail end of the trip. Patience… =D@kunhuo42 – @Fatcat723 – Yeah, Rob, I think Aaron is a bit biased in his opinion about Hawaiian sunsets, but they ARE pretty fabulous. @murisopsis – Interesting question that came up to which we eventually got an answer. The islands are made from lava but, with a few exceptions, the beaches are not made of black sand but generally “white” sand. We wanted to know why. Turns out it is because of the coral reefs offshore. Most of the sand comes from the reefs and broken down shells, and not very much from the lava. @slmret – Yes, none on Kauai, something about which they are very proud. @CurryPuffy – What time of the year are you going? It seems like prices should go down a bit after high season (winter/spring) is over. @julieae – @swtaznxtc90 – Thanks! 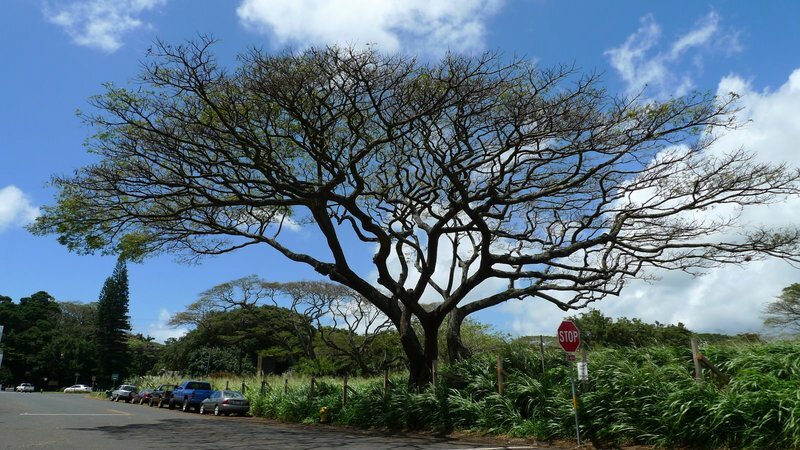 @ordinarybutloud – There is a tree similar to it here in Thailand, with a very horizontal, stratified canopy. I think if I ever have land here, I’ll plant some. They make for wonderful shade. @christao408 – me? biased? surely not! 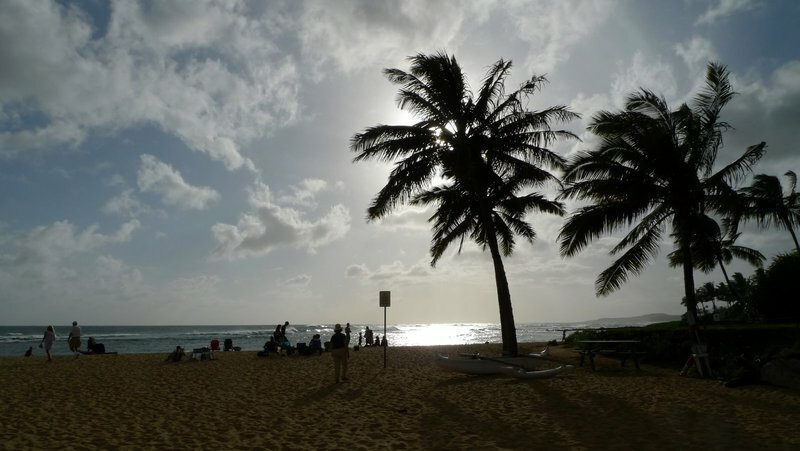 =Poh, yes, regarding your comment about beaches… that is right, hawaii has predominantly white sand beaches, generally the result of coral reefs (although some beaches, including the most famous one — waikiki — are man-made). on the other hand, if you go to the big island you can definitely catch a glimpse of a black sand beach, or even a green beach (from a particular type of glass that sometimes forms during a volcanic eruption). Beautiful place, I’ll love to go there. try the princeville resort. Don’t stay there, just park there and climb down to the beach. There are some interesting coves/caves that only the locals know about. Napping is always a good thing. I’ve always said that if I had to be a bum, I’d move to Kauai, where I’d have an endless supply of chicken to eat. 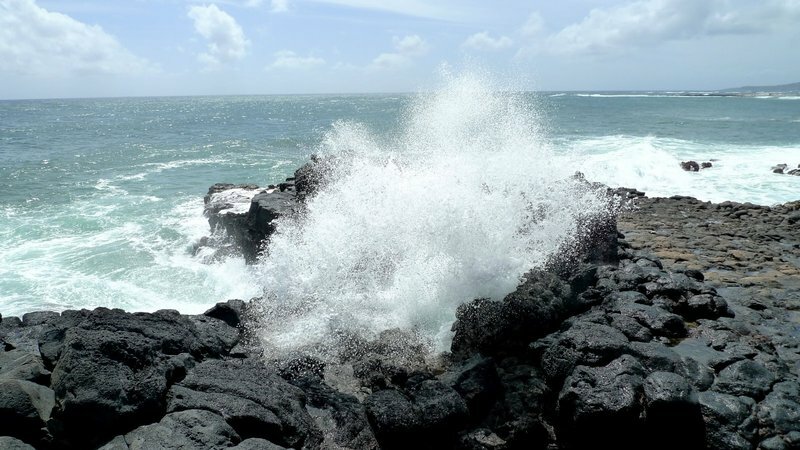 I could almost hear the waves crashing on the lava rocks. Beautiful pictures Chris. I am so happy your mother was with you. What a fun time.